Steve Hinton begroet het Flying Legends 2018 publiek. Kort hiervoor maakte hij deel uit van de USAF Heritage Flight, waarin hij samen met een P-51D Mustang, gevlogen door Dan Friedkin, een F-35A Lightning II begeleidde. To 39 MU, RAF Colerne on 020143; 215 MU, Locharbriggs later in 0143. Allocated to RAAF; Shipped to Australia aboard SS Tijuga at Locharbriggs (040243); Arrived in Australia at 1 AD, RAAF Laverton on 150443. To RAAF as A58-178 (....); Issued to 79 Sq, RAAF Laverton on 070543; Returned to 1 AD for Temperate Cowling Modification, including the removal of the Vokes Tropical Filter intake) on 190543; Returned to 79 Sq, RAAF on 010643; As 'UP-G' (...); Tasmania emblem on port cowling (Map of Tasmania with caped devil superimposed). To Kiriwana airfield, Trobriand Islands New Guinea (now Papua New Guinea) during 0843. A/c assessed by 11 RSU on 170144. Wfu on 190244 and stripped for useful parts. Remains of fuselage and wings recovered from Papua New Guinea by N. 'Monty' Armstrong in 1974, along with wreckage of two more Spitfires; To N.Armstrong, Dairy Flat, Auckland, New Zealand (...). To Don J. Subritzky in 1975. For Raw to Don J.Subritzky in 1986; Reg. ZK-MKV allocated. Sold to Karel Bos in 1999; To HFL, Audley End for Raw in 0799; Arrived in 1199. Parts of EF545 (A58-149) used in restoration. Reg. G-LFVC on 280999. (Serial also quoted as JG981). Volkes Tropical Filter installed as well as 4 cannon wing configuration. Ff on 021106 from Duxford. As ‘T-B’, 249 Sq at RAF Takali (Ta Qali), Malta in 1943, c/s of Spit JK879, (del. to Malta on 010643) and flown by F/S John “Jack” Hughes, RCAF. ​Sold to Tom Blair (Spitfire Ltd), Kissimmee, FL, USA. Last UK flight from Duxford on 210208; JG891 arrived at Kissimmee in early 0408; re-assembled and ff on 140408. 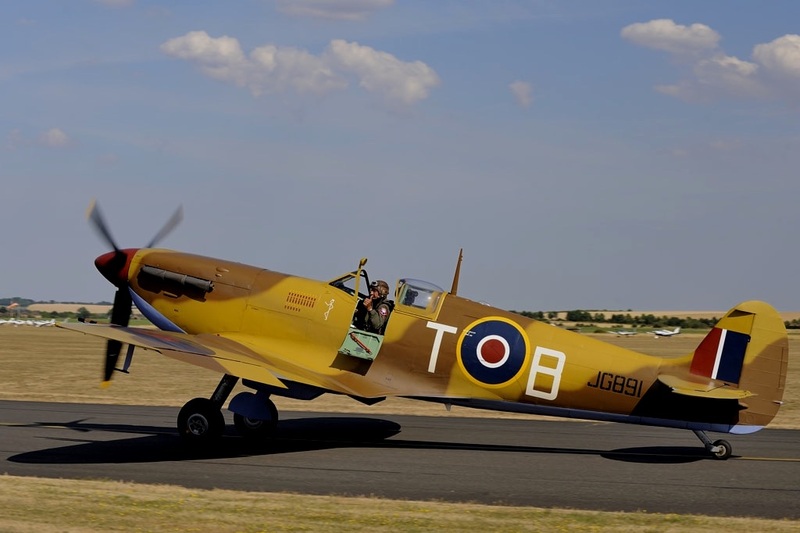 Sold to Tom Friedkin (Comance Fighters LLC) in 1208; JG891 based at Planes of Fame, Chino, CA, USA (...); JG891 resprayed in c/s to represent a Spitfire flown by W/C Robert Stanford-Tuck, as 'RS-T'. Damaged on 040717 on landing at Marana Regional Airport (KAVQ), AZ, USA. Dereg. as N5TF on 251017 and shipped to UK for repairs. Reg. G-LFVC on 311017 to Comanche Fighters LLC, Barnet. Under Raw with HFL, Duxford (...); Finished as ‘T-B’, 249 Sq at RAF Takali (Ta Qali), Malta in 1943, c/s of Spit JK879, (del. to Malta on 010643) and flown by F/S John “Jack” Hughes, RCAF. 'Saint'-motif in red on port fuselage, below windscreen as well as 26 bomb mission symbols on main fuel tank plating. Ff on 021106 from Duxford by John Romain. Last noted Aw at Duxford during Flying Legends 2018 during the weekend of 14/150718.